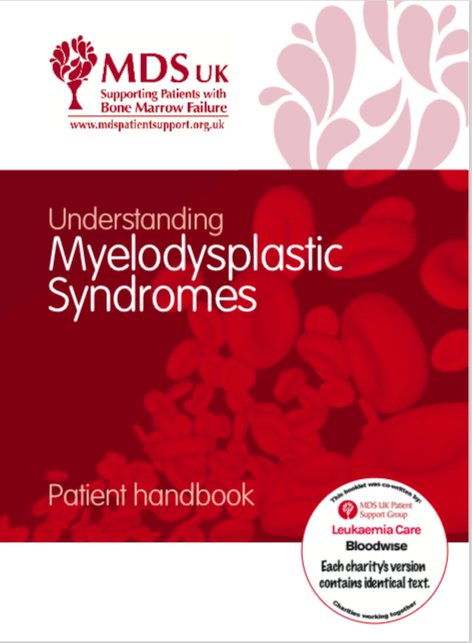 How are the Myelodysplastic Syndromes diagnosed? Low blood counts are picked up by a simple test called a full blood count (FBC). The laboratory performing the test will then examine the blood cells on a slide (called a blood film) under the microscope. 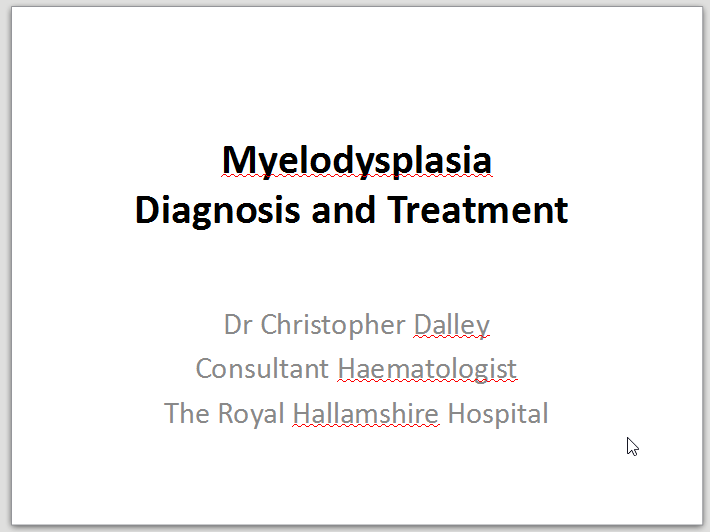 If you are found to have changes on the blood film that suggest MDS, you will usually be referred to a blood specialist (haematologist). It is important to rule out other causes of a low blood count so the doctor will ask general health questions and give you a physical examination. As MDS is a disease of the bone marrow, a bone marrow test is usually needed to diagnose the condition. A small amount of bone and bone marrow are taken, generally from the pelvis (hip bone). The doctor will numb the area with local anaesthetic and a needle is inserted into the bone marrow cavity. A small liquid sample is taken followed by a biopsy. Preparing the sample and analysing all the results can take two to three weeks. The bone marrow sample is processed in the laboratory and examined by a doctor under a microscope to look for changes seen in MDS. Additional tests are often requested on the bone marrow sample, which may help to make the diagnosis and provide information about how the disease will behave (prognosis). These include cytogenetics (sometimes called a ‘karyotype’), which is the study of the changes in the structure of the chromosomes in the affected cells. In most cases of MDS, the typical features are present in the bone marrow and the diagnosis is straightforward. However, unlike most other diseases, there is currently no specific diagnostic test for MDS and so reaching a diagnosis can sometimes be challenging and take a little longer than expected. 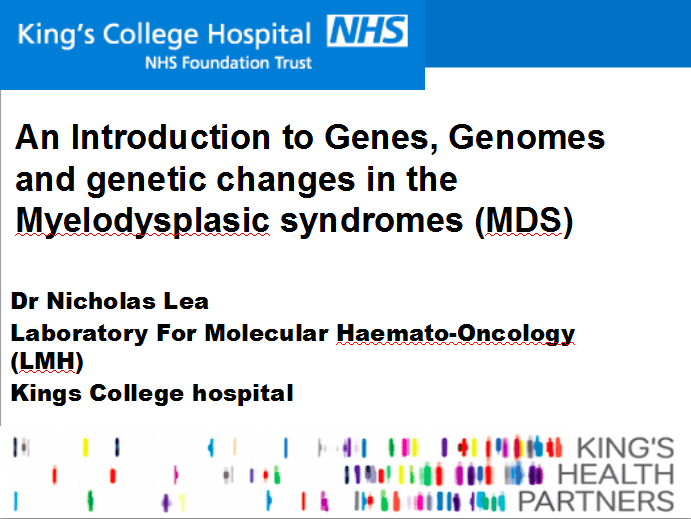 Download this presentation and get to learn more about the DNA and the genes, and how the latest advances in DNA can have an impact in how MDS is diagnosed and treated. For health professionals. 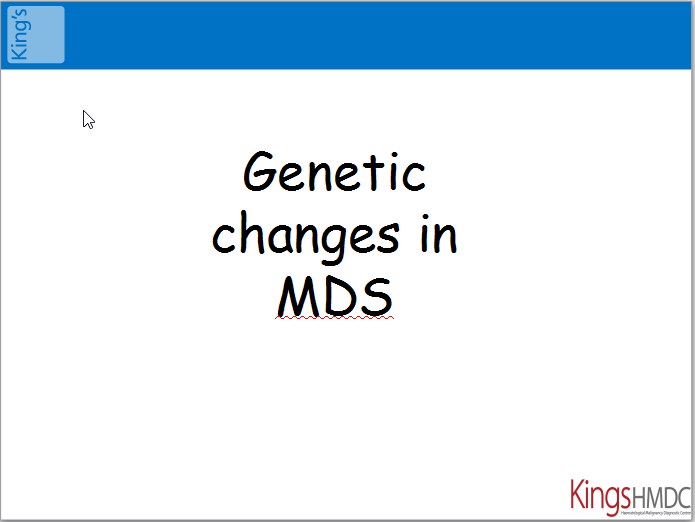 Download this presentation and learn more about the genetic changes in MDS.